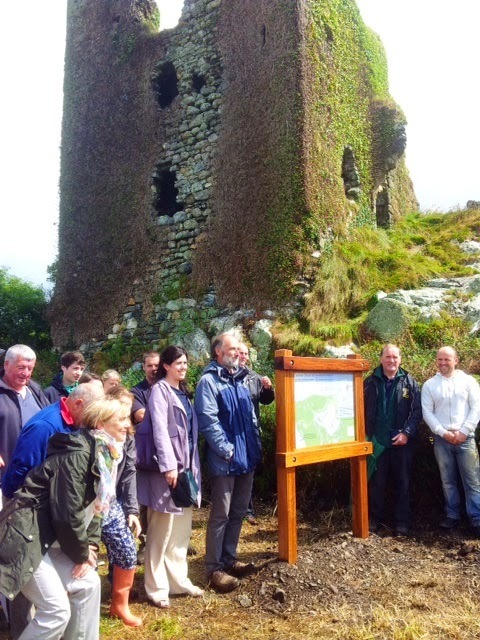 Dungarvan Hillwalking Club. November News Letter. C walk Sunday 9th November. Kevin Moore led 23 of us to visit the Comeragh Lakes. On arrival, he decided to alter course, as underfoot conditions were not to his satisfaction, and headed instead to the Sgilloges. We headed back and Kevin was worried as daylight was fading. Tom Murphy, sweeping, asked some ladies to ease up on the talk, but to no avail, but amazingly, the talk increased but so did speed of walk. Tom suggested we change the name of the club to The Talking Club but no takers. Needless to say, we arrived back safely, and seriously, a great days exercise was had by all, and good to see a few new members present also. Buíochas to Kevin. A brave group of 6 ventured onto the mountain at 18:00 on a dark cold and very wet under foot walk. The idea was to experience walking on mountainous terrain in the dark and to see how different everything looks at night. At the Carraigaline mast we turned off our torches and experienced the eerie calm and blackness, with only the distant lights of the surrounding villages to give us any orientation. A short walk but a great experience, which will be repeated next year. Congratulations to all club members who supported and completed the Long Way Round night walk on the 29th. A great night was had by all. A dozen set off last Sunday, rucksacks bursting with gear, hot drinks and tucker, for a day that started off at minus 2 degrees. We were in for a pleasant surprise though; it was pleasantly warm with clear blue skies and barely a breeze in it. Some were heard complaining about how the bright sun was impeding their vision…isn’t that a great complaint for late November.We started off not far from Mountmellary and proceeded to the Liam Lynch Memorial where we sat on the low wall in front of a sculpture of cast bronze Irish Wolfhounds. We ate our lunch and as always dining al fresco is wonderful. We then progressed by climbing up to Cruachan West stopping to take in the views. Tom then lead us on to Knockmeal and it was from there we began our trek downwards and back to the cars for five minutes, before the obligatory stop-off at the Cats Bar. What a lovely end to a great day. Thank you Tom. “A Walk For All The Seasons” Sgilloge Loughs-Coum Lara Horseshoe Walk. 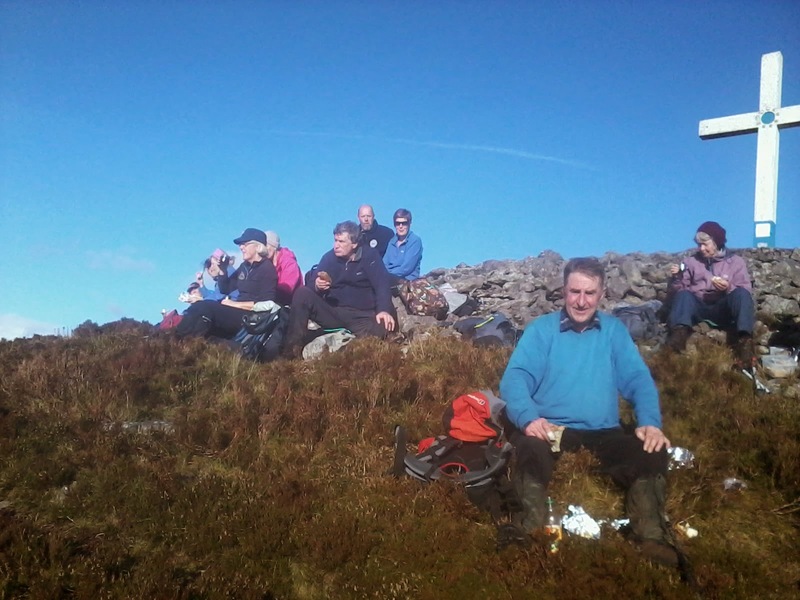 Oct saw our intrepid “C” walkers back in the Comeraghs to walk the 11Km. Sgilloges/Coum Lara circuit. Our walk started in the beautiful, incomparable Nire Valley, where it is said, “it is easier to walk than not to walk”. A valley that is serenaded night and day by the tall cliffs and many streams that flow into the Nire river. We followed the pathway that leads from Whelan’s farm and out onto the open bogland and the townsland of Carrigeen. 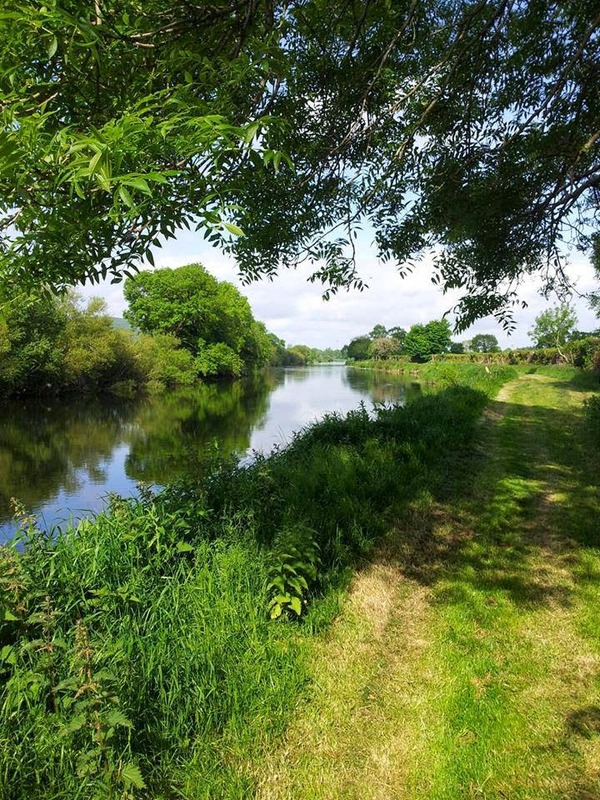 This is an area rich in archeological history, with up to 15 sites of interest, with old huts, earthworks, fulacht fiadh and the Carrigeen Standing Stone, considered to be one of the finest examples of its type in Munster. From here we walked the waymarked pathway into the upper lake of the Sgilloges in glorious sunshine, with the Sean Bean stream, which flows down from the steep cliffs of the sandstone rock of the ridge, forming a perfect backdrop. The heavy rainfall of the previous 3 days, and the northerly winds made it an impressive sight, whipping the water upwards onto the platue above. After a short break we climbed the gentle slopes out over the shoulder to the east of the lake, and contoured into Coum Lara, crossing the fast flowing stream that flows out of the Coum. From there, we crossed over open bogland and heather covered boulders to arrive at The Gap and join up with Boreen an Socraid/The Funeral Path. To the northwest, Knockanaffrin Ridge rises majestically, and away in the distance we had a clear view of Slievenamon, whilst to the south, the steep climb onto Carrigshaneun looked imposing. Throughout the 19th century, and indeed into the early part of the 20th. century, the Boreen an Socraid path provided families who lived on both sides of the valley with safe and easy passage, and in 1930, locals witnessed the last funeral procession to cross the mountain track with the remains being taken from Rathgormack to the Nire. As daylight began to fade, the group headed back the pathway, to arrive back at the Nire Carpark in glorious winter sunset. A pleasing feature of the walk was the number of walkers who crossed the route for the first time, and it was great to see new members out in the mountain in such high numbers, so why not encourage a friend to join the club and experience for themselves the beauty of the Comeraghs. The ‘C’ walk on Sunday September 14th was a real pleasure. A local mini bus transported us from Carrick on Suir to Kilsheelan. On arrival there, our Kilsheelan member brought us for a tour through his late summer garden pointing out interesting plants and imparting green-finger tips. Thank you James! We then headed towards river bank and began our trek of approximately 12kms. There were about twenty of us in all, some regulars, some not so regular, plus a couple of guests. Ronagh was leading and many of the walkers had recently returned from the club holiday to Switzerland, so recounting stories and reminiscence was the order of the day. 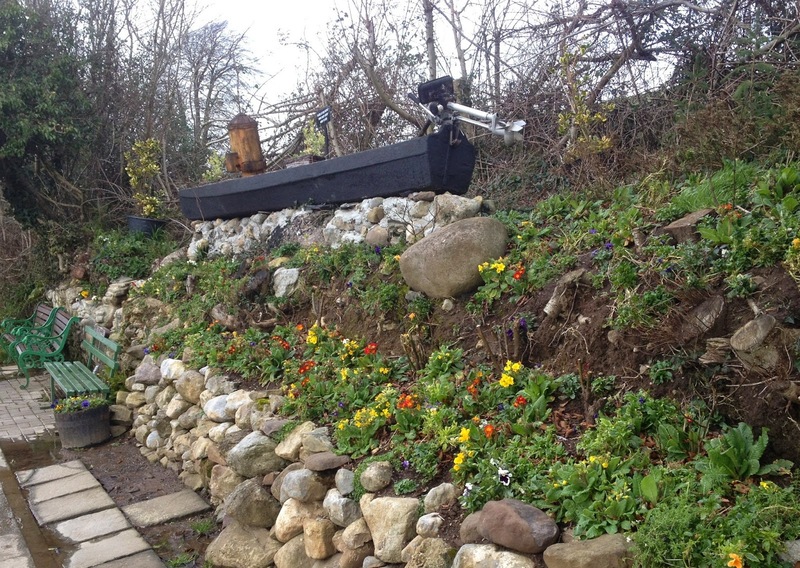 The old barge towpath was in excellent order; not a muddy bit in sight! The weather was perfect for walking and as we ambled along, we met several fishermen along the way. We passed the recently erected monument Elm Ditch Well, a voluntary undertaking by local fishermen as a fitting legacy to the memory of their predecessors now passed on. This was a very enjoyable way to spend a Sunday afternoon. Please consider being a club officer or committee member for the forthcoming year, the club needs these people for the walking and social events during the year. If interested please contact any committee member. Club badges will be on sale at the AGM. 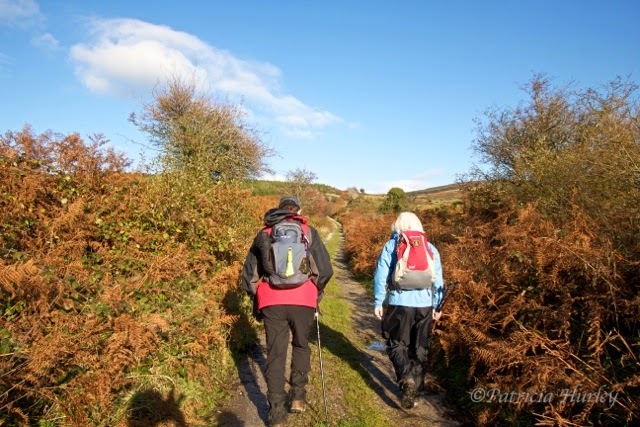 Notice is hereby given of the Dungarvan Hillwalking Club AGM, which will be held on Tuesday 7th October 2014 at the Park Hotel, Dungarvan, at 8pm. All members are cordially invited to attend and new members are most welcome. 2. Approval of Minutes of AGM 8th October 2013. Walks Coordinators, A, B and C.
Dungarvan Hillwalking Club will donate €810 to West Waterford Hospice following the very Comeragh Crossing on July 5th. The club pledged to donate €5 from the entry fees of each participant, and 162 people took part in total. Despite heavy clouds, it turned out to be a perfect day for walking as the John Browne Division of the Thursday walking set ventured to the Eastern half of the county for a walk by the Carrigavantry Reservoir. 13 walkers set off from Fenor carpark and the combination of warm sunshine and a fresh breeze created ideal walking conditions. The walk took approximately two and a half hours and the walkers strolled down laneways with bushes that were filled with blackberries. Needless to say, the walkers gorged on the plump black fruit. They stopped to let horses pass and then jumped over puddles created after the horses churned up the ground. Afterwards, the Dungarvan Baking Committee were in full force and the walkers munched tart made with forest fruits and Madeira cake, washed down with tea.